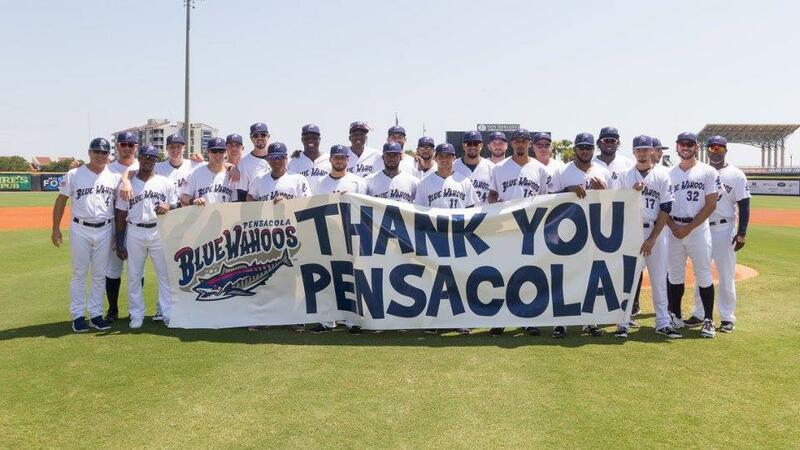 The Pensacola Blue Wahoos now play in America's Strongest Town. After team owner Quint Studer was joined by two other community leaders, Anna White and Dottie DeHart, in submitting Pensacola's entry to the Strong Town contest, the support for Pensacola enabled the city to win four rounds of voting among the 16 finalists. Pensacola won the final round over Portsmouth, New Hampshire in a 58-42 percent margin. "This is a community honor, which makes it very nice," Studer said. "Strong Towns has a very large following. All of the cities Pensacola was up against are places working very hard to move in the right direction. "The people you are being compared to are tremendous cities in their own right." The 2012 opening of Blue Wahoos Stadium and the Vince J. Whibbs Community Maritime Park has led to seven positive years of business and residential growth in downtown Pensacola. The Blue Wahoos have attracted 300,000-plus fans to the ballpark in each of the seven seasons in franchise history. The stadium and the Blue Wahoos franchise has won numerous awards. Studer said winning the Strong Towns vote provides another notch of awareness for the Pensacola community. "This is just one more step. We've had a lot of publicity. And I think any time you receive that you can just keep building momentum," Studer said. "I think it's another step in the right direction. "I was speaking in Miami. My speech discussed things we were doing in Pensacola with the Brain Bags, the Early Learning project, the CivicCon stuff. There are a lot of amazing things going on in Pensacola." In 2006, Pensacola voters approved the Community Maritime Park project which included a stadium that is now home to Pensacola's Double-A franchise and one of only 30 cities in America with a Double-A level team and its Major League Baseball affiliation. "This is not one thing or one person," he said. "It all adds up together. People should never underestimate their influence, their vote, showing up for something."